What do the following have in common: a donkey named Lightning with the face of a woman, a middle of the night trip into heaven and back, a valuation of only five percent, and rival political leaders? The answer is the story behind how and why the Temple Mount transitioned from Jewish control to Muslim. Last week, we traveled back three millennia to David’s purchase of the farm that would become the Temple Mount; the building of the magnificent First Temple by Solomon; the delayed construction of the smaller Second Temple in 516BC; Herod the Great’s remodel and expansion in 19BC; and the war between Jewish Zealots and the eventual destruction of the Temple in AD 70. For a great majority of the Mount’s first thousand years, regardless of what empire ruled the region, the Temple Mount belonged to the Jews. The next 568 years featured rule first by the Romans and then by the Byzantines. Roman Emperor Julian in AD 363 granted the Jews permission to rebuild the Temple. As with most decisions by leaders, this one was a political one. By this time, the split between Christianity and Judaism was beyond repair and thus the Christians viewed the demolished Temple as a representation of their faith as greater than Judaism. Julian had turned his back on the Christian faith, thereby politically and personally he favored the rebuilding of the Temple by the Jews. Despite his go-ahead, the construction never got off the ground. Historians argue over the cause of this, attributing either an earthquake in Galilee or the ascension of a new pro-Christian emperor in Rome – both occurring in the summer of AD 363. The Sassanid Empire took over in AD 610 and gave control to the Jews, albeit for a short time. A partial Jewish Temple began to rise on the Mount, but five years later, the Byzantines regained control, the unfinished sanctuary was razed and the area used as a garbage dump. Enter the Muslims. Caliph Omar took the city in AD 638. Right away he looked for a site to establish the masjid (mosque) of al-Aqsa. Al-Aqsa in Arabic means “the furthest,” thus Omar was looking to set up the famous Furthest Mosque, referenced in the Koran. The 7th surah (or chapter) of the Koran mentions the furthest mosque: “Exalted is he who took his servant by night from al-Masjid al-Haram to al-Masjid al-Aqsa, whose surroundings we have blessed, to show him of our signs.” This verse is speaking of Muhammad and his famous “night journey,” which I will explain in a moment. The mosque of Haram was located in Mecca and the location of the mosque of al-Aqsa was unknown – no reference is actually made as to its location. Muslim tradition holds that al-Aqsa, the destination of Muhammad’s night journey, was located in Jerusalem, more specifically the Temple Mount. This would fit since Jerusalem was far from Mecca, especially at that time. The story has Muhammad, the “prophet,” being called in the middle of the night to take a journey. He rode to Jerusalem astride his heavenly donkey, al-Buraq, which translates to “lightning.” This donkey is purported to have the face of a woman and wings protruding from his thighs. Once the night journey stopped in Jerusalem, Muhammad was taken into heaven via a light ladder where he was given special instructions from Allah, and then he came back down. But right away we encounter a problem related to Al-Aqsa and the location of Jerusalem. The problem stems from the fact that nowhere in the Koran does it mention that Jerusalem was the actual destination of Muhammad on his night journey. In the 21st century, the traditions have it fixed there and no one questions it. So how did a vague reference to a “furthest mosque” in the Koran – written 20 years after Muhammad’s death – solidify into Jerusalem becoming a new site? The answer lies partly in the Hadith, a collection of oral Islamic histories separate from the Koran. The Hadith gives a much more detailed account of Muhammad’s night journey, including the anthropomorphic donkey and its name. Jerusalem is mentioned in there as well, and this time it is fixed as the location of the furthest mosque. The Hadith, it’s important to note, wasn’t made available in written form until the ninth century, 200 years after Muhammad died. I have to wonder, though, if the night journey surah in the Koran denotes Muhammad traveling from one mosque in Mecca to another in Jerusalem, where was the mosque on the Temple Mount he traveled to? There wasn’t one. A mosque was later built in AD 715 by Caliph Waleed – 83 years after Muhammad’s death. It was named al-Aqsa Mosque, but at no time during Muhammad’s life – and certainly not during his night journey – was there a mosque on the Temple Mount. Prior to Caliph Waleed and the building of al-Aqsa, another Caliph named Abd el-Malik began construction in AD 691 on the Dome of the Rock, to be located in the middle of the Mount on the famed foundation stone of the original temple. It is perhaps the erecting of this shrine that further popularized the Jerusalem as destination myth of the night journey. Why did el-Malik build the Dome? Politics. Jerusalem was not a city thought highly of by Muslim leaders – in fact, it was one of the last cities conquered during by Muslim armies after the death of Muhammad. Menashe Har-El, in his 1977 book This is Jerusalem, published a Muslim proverbs that reads, in part, “One prayer in Mecca is valued as ten thousand prayers; a prayer in Medina is valued at one thousand prayers; and a prayer in Jerusalem at five hundred prayers.” For those of you math whizzes, Jerusalem comes in at 5% of Mecca. It doesn’t seem that Jerusalem is high on the priority list. A caliph in Mecca and Medina, the two holiest cities in Islam, controlled the mosques there and, according to records, was a rival of Caliph el-Malik. In order to compete against this political contender, el-Malik built the Dome of the Rock. Later al-Aqsa was built and Jerusalem transitioned from an obscure city unimportant to the Muslims, valued at 5% of Mecca, to that of the third holiest site in all of Islam. Muslims controlled the Mount for another 400 years, until Christians took the city in 1099 during the First Crusade. A new order called the Poor Knights of Christ and the Temple of Solomon set up shop in al-Aqsa – an order that would become the Knights Templar. Tenancy on the Mount began with Jews, transitioned to Muslims, then shifted to Christians – all in the first 2500 years! No wonder there is such contention today as to who has rightful ownership of one of the holiest sites in the world. Next article will wrap up the three-part series on the Temple Mount by examining the last 500 years, bringing full-circle the tale of the Jews in Jerusalem. Well, sort of. 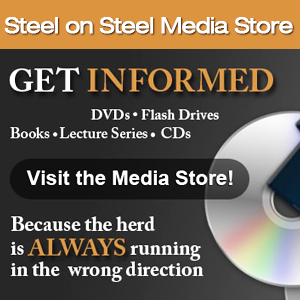 Steve Schiller is a producer with the Steel on Steel radio show, a weekly newsmagazine that gives you 90 minutes of solid news and commentary, much of which you will not hear elsewhere.